Spokane families will be able to have their privacy in their individual homes and build relationships in their community through several different shared spaces among residents. A common house will sit in the center of the community. SPOKANE, Wash. — A growing housing trend is coming to Spokane and those people in charge of the project said it's a different way of living that allows for closer relationships. Mariah McKay and Jim Dawson live in a home on the South Hill overlooking beautiful property that will soon be home to 34 families. They said it is the perfect spot for a cohousing community. "Cohousing is basically a custom neighborhood designed by a community of people in a way that facilitates a robust to social life and opportunities for collaborative living," McKay said. Developers hope to break ground on construction this spring and have families moving in to the site in the Perry District neighborhood by the summer of 2020. Families will be able to have their privacy in their individual homes and build relationships in their community through several different shared spaces among residents. "Privacy and independence in our home, but community at our doorstep is really the thing that drives home for me the value of cohousing," Dawson said. At the center of the community will be a common house. "An enhanced community living facility that includes a large kitchen for cooking common meals together, a dining hall, a kids playroom," said McKay. Other amenities will include a small out building for quiet reflection, a shop for musical rehearsal, a teen hangout space, a community garden and much more. McKay and Dawson are both community organizers who said cohousing is the way they would like to raise their future children. "People say that it takes a village to raise a child and we wanted to build that village so that we then have children and a healthy well-balanced environment," McKay said. "We've kind of gone too far in the direction of independence and we've lost connections that give our lives and meaning," Dawson said. "Cohousing is a way to make sure no one is left behind and that no one is forgotten." 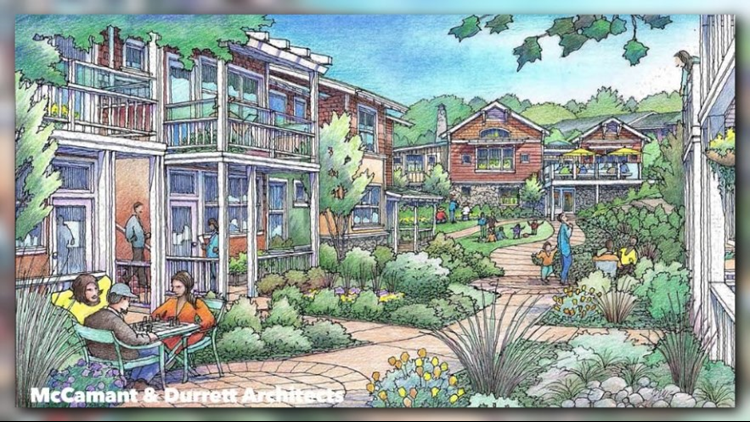 Dawson said cohousing is one of the most green ways to live in the United States since families share resources and space. "Spokane is a great place to raise a family and to have cohousing in Spokane, it's just a natural fit," McKay said. Both McKay and Dawson said they have seen a lot of interest from families so far. For more information of Haystack Heights and cohousing in Spokane, you can reach out to McKay and Dawson through the Spokane Cohousing website or the Facebook page.